You might be wondering how you’re going to service your clients with different types of hair and body treatments without compromising on the cleanliness of your salon. Salonwear brings to you one of its hottest selling products, the waterproof cape with polyurethane top and silkara iridescent bottom. Apart from facial treatments, these capes can also be used for hair treatments. Apart from these combination capes, Salonwear presents to you a range of other salon based apparels and accessories like hair cape, black cape, esthetician uniform, wholesale robes, grooming smocks, aprons with pockets, spa wraps, terry cloth headbands and a lot more to amaze you! 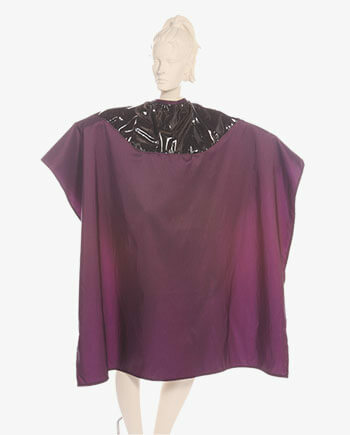 The combination capes with waterproof polyurethane tops and silkara iridescent bottoms are mostly used as ladies capes. 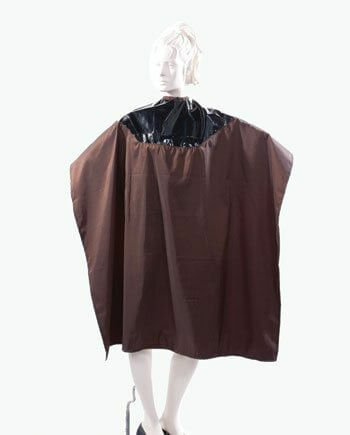 Due to the top quality of the polyurethane top, the hairdressing cape prevents water from passing through it. This, in turn, keeps your clients cool, comfortable and dry during any salon treatment. 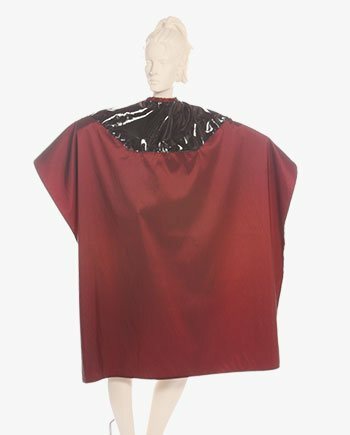 The water and color proof hairdressing cape tops, offered by Salonwear, have silkara iridescent fabric bottoms that are stain and chemical resistant. This ensures that such substances don’t ruin your client’s clothes. Salonwear also offers makeup capes, salon capes, printed capes, super capes, kids haircut cape and more. 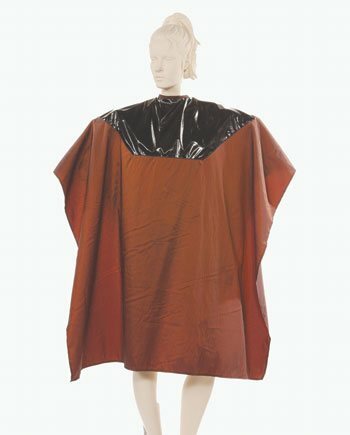 The waterproof polyurethane top makes the cape suited for different purposes like haircuts, hair coloring, bleaching, shampooing and a lot more. These capes are specially made for all wet treatments. Only the best combination barber capes are made with our signature durable stainless steel snaps. 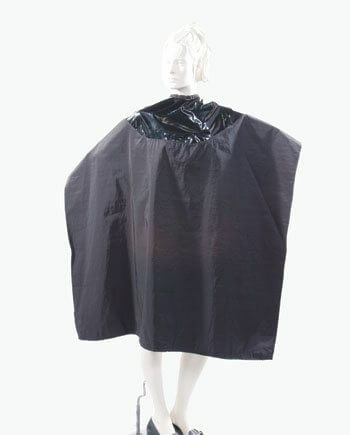 The neck size of the hairdressing waterproof cape top can be adjusted from 12 inches to 24 inches depending on whether your customer is a kid or an adult. The average size of these capes is 50 inches wide and 60 inches in length. 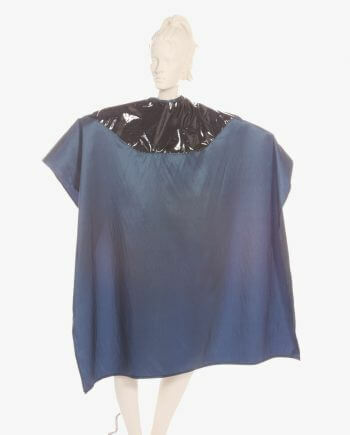 Hair will not stick to the Polyurethane top or the 55% Polyester and 45% Nylon bottom on this excellent stylist cape. Your customers will be clean and comfortable! A plethora of colors is available at Salonwear. Although the polyurethane top is available in black color only, the silkara iridescent bottom can be found in a variety of colors such as black, bronze, navy, brown, wineberry and burgundy. 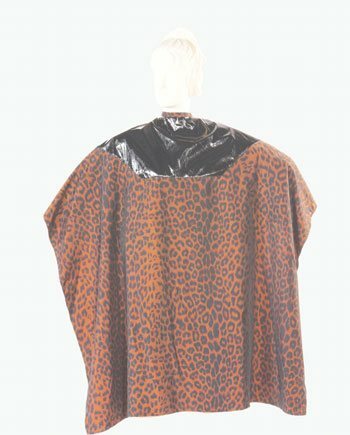 Salonwear’s combination capes are available in leopard print also! This unique print option would definitely be attractive to your customers. Salonwear’s differentiating feature is customizing salon apparels. You can not only have the most trendy and stylish designs but also raise awareness of your brand by branding your logo on your capes and other apparels. We offer two unique branding services: embroidery and screen printing. Get your salon capes customized now! Thriving in the salon industry for 31 years, Salonwear has successfully established itself as a trustworthy name in the market. What started as a family venture has now accumulated a large and loyal customer base, which is continuously growing with the passage of time. We are constantly adding new and happy customers to our Salonwear family! In this dynamic age, our aim is to constantly understand the customers’ ever-changing needs and requirements, and update all our spa and salon products accordingly. Hence, Salonwear has today become a trustworthy brand.